Mint Director James Pollock proposed in 1865 that a coin made of a copper-nickel composition be produced. The silver half-dime was still being minted, but like most silver coins in the Civil War era, had difficulty remaining in circulation because of fearful hoarding. Fractional paper currency worth five cents circulated readily, but was a poor substitute for hard coinage, Pollock concluded. On May 16, 1866, a five cent coin composed of 75% copper and 25% nickel was officially authorized. A shield was chosen for the obverse side, patterned after the shield design of the Two Cent coin released in 1864. Thus, the name "Shield Nickel" was applied to this coin type. The reverse contained a large numeral 5, encircled by 13 stars, with rays interspersed between the stars. Coin hoarding by a nervous public created a shortage of coins during the Civil War years. Paper tickets, stamps, and bills were often used in place of coins, but the scarcity was so intense that Congress sanctioned the printing of "fractional currency, also known as "paper coins". 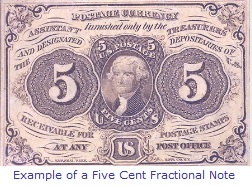 A five-cent fractional currency note is shown above. From 1862 to 1876, the U.S. government issued more than $368 million in fractional currency in denominations ranging from three to fifty cents. 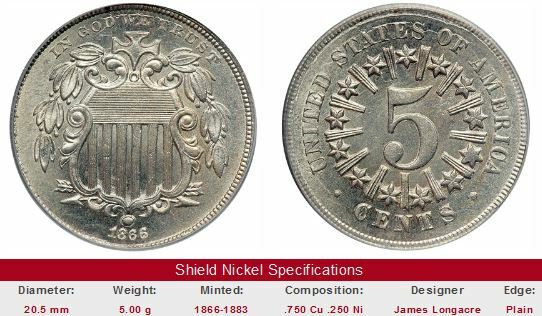 After the Civil War, fractional currency was no longer needed because coins like the Shield Nickel began to circulate freely. 1876 was the last year Congress authorized fractional currency. Photo courtesy of Ira & Larry Goldberg Coins & Collectibles, Inc., Beverly Hills, CA. It didn't take long to realize the rays caused problems with metal flow during striking, resulting in many coins of weak sharpness. Early in 1867, the rays were removed from the design. Shield Nickels of 1866 and 1867 with rays having bold sharpness are worth premiums because of their scarcity. Key date Shield Nickels are offered for sale below through US coin eBay auctions. The left hand side of each "Sales Box" is value trend data over a very long period of time for a coin of that date in VG-8 or Proof-65 condition. The percent annual increase is computed for comparative purposes. The coin pictured for sale in the right hand side is not necessarily the same condition coin as that represented in the value trend analysis on left hand side.